The Fiesta Christmas Tree platter is a recent creation, and I couldn’t resist! It was sold out in Shamrock on Herberger’s online shop, so I chose the Scarlet and I couldn’t be happier! 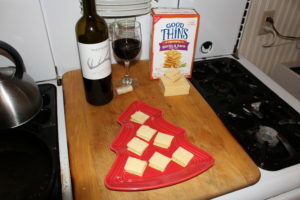 I used it during my traditional Wine and Cheese Christmas Tree Decorating Party and it was perfect! Kerrygold White Sharp Cheddar cheese made in Ireland, a delicious chickpea cracker with garlic and herbs, and Shed Horn Cabernet Sauvignon purchased at a wine tasting event at the fabulous Vine 19 in Havre, Montana-a perfect combination to a magical evening!